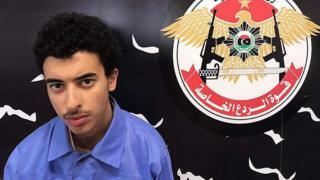 Hashem Abedi, the younger brother of Manchester bomber Salman Abedi, will be tried in Libya over his suspected role in the attack, the BBC has been told. The 20-year-old was arrested in Libya shortly after the suicide attack in May that killed 22 people. Libya's chief investigator in the case, Asadiq al-Sour, said Mr Abedi is suspected of having helped his brother and collected materials for the attack. Their father Ramadan, who was also detained in Libya, has been freed. Hashem Abedi will be taken to court within two months at most, Mr Sour told BBC Middle East correspondent Orla Guerin. Libya currently has two rival governments - Mr Sour works for the one backed by the UN, based in the capital, Tripoli. The country has been wracked by conflict since a Nato-backed uprising against long-serving ruler Col Muammar Gaddafi in 2011. The Greater Manchester Police (GMP) force in the UK said that contrary to earlier reports, Hashem Abedi has not been questioned by British police in Tripoli. "Mr Abedi is a suspect in the investigation and if he were here [in the UK] we would arrest him," the GMP said in a statement. The GMP statement went on to say that discussions had taken place with the Libyan authorities in respect of Mr Abedi but that no further details could be made available. Greater Manchester Mayor Andy Burnham has said that any trial connected to the attack in May should take place "in the UK under British law". The Libyan authorities later said they had no concrete evidence against Mr Abedi's father, who has returned to the family home on the outskirts of Tripoli. When the BBC visited the building, our correspondent was told he was tired and unwilling to comment. A relative, however, said Mr Abedi had been shocked at what his son Salman had done. No father wants his child to be a suicide bomber, he said. Salman Abedi detonated a home-made bomb in the foyer of Manchester Arena as crowds were leaving an Ariana Grande concert on 22 May. The 22-year-old, who was born in Manchester to Libyan parents, had left the UK on 15 April and travelled to Libya before returning to the UK four days before the attack. Another relative of the Abedi brothers, Mohamed Younis Abedi, is in custody in eastern Libya. His credit card was allegedly used to buy components for the bomb. The authorities in Libya have also given British police a list of names of people in the UK who they say should be questioned. They are not necessarily suspects but could provide important information about the bomber and his brother, the BBC was told. Manchester attack: Who was Salman Abedi?